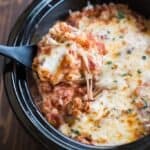 The creamy, sauce-y cheese ziti that you love, made in your slow cooker! 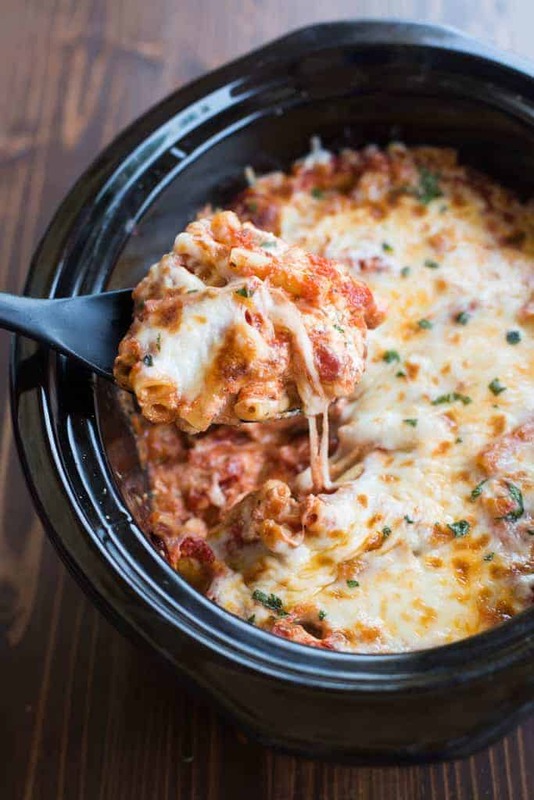 I’ve got another one pot wonder for you guys today: Slow Cooker Three Cheese Ziti. Complete comfort food bliss! 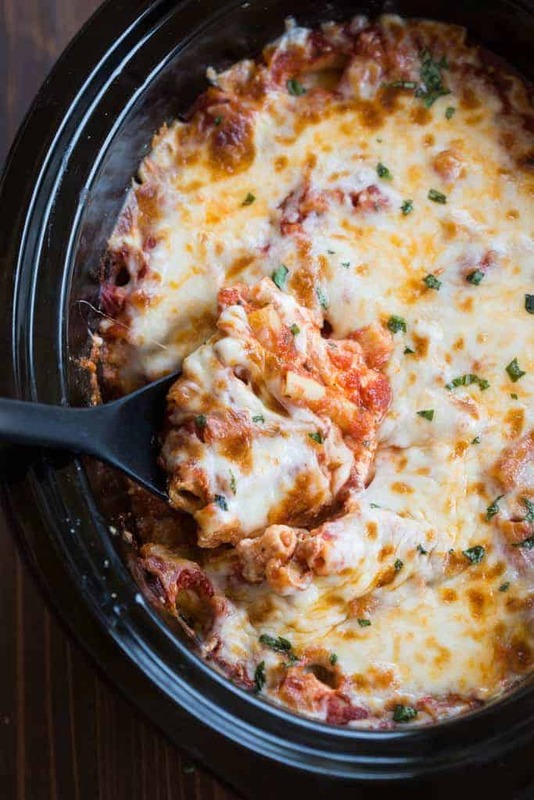 Baked ziti has always been high on my list of favorite cheesy pastas. It’s usually my go-to if we’re ever eating at olive garden. It’s simple amazing, especially paired with their awesome breadsticks (here’s my homemade olive garden breadsticks, in case you want to make them yourself!). I have a one pan baked ziti recipe on my blog that I shared a little while ago. It’s one of my family’s favorites and it contains a yummy meat sauce. 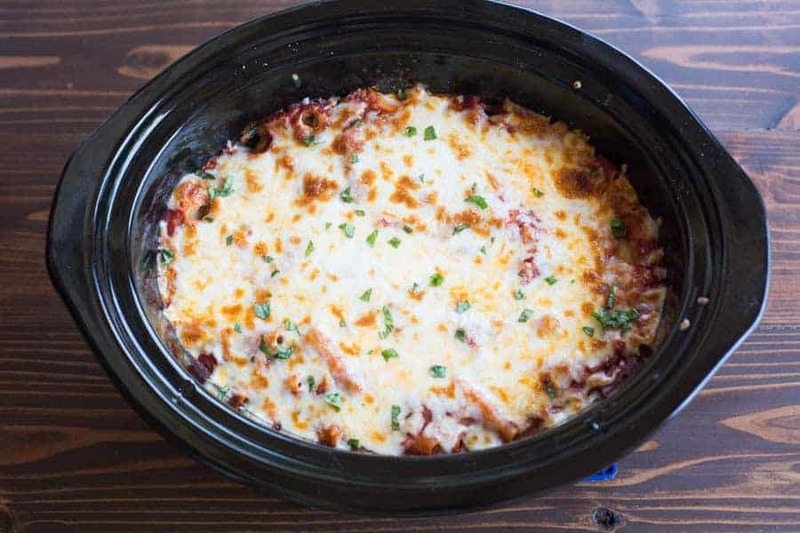 This slow cooker three cheese ziti recipe is a little different. First, it’s easier than the other (although both are made in just one pan, so you can’t go wrong!). This one has even more cheesy-ness going on than the other. 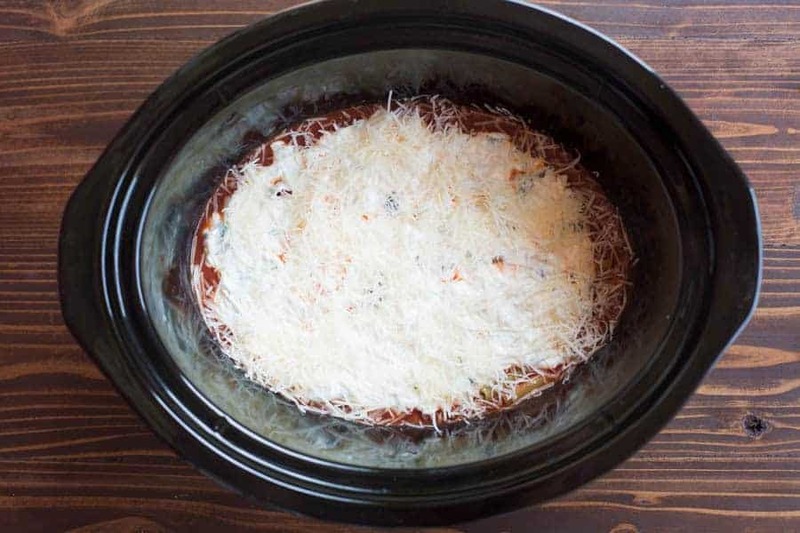 It’s reminds me of my favorite slow cooker lasagna recipe in the way that everything is layered in the crock pot. I love how the noodles are added, uncooked, straight from the box. You don’t have to cook or pre-prep anything before making this. This meal is a total winner in the “fix it and forget it” category and the end result is tender noodles sandwiched between layers of cheesy deliciousness. Add cream cheese, sour cream and ricotta to a mixing bowl. Beat with electric mixers until smooth. Stir in garlic and basil. 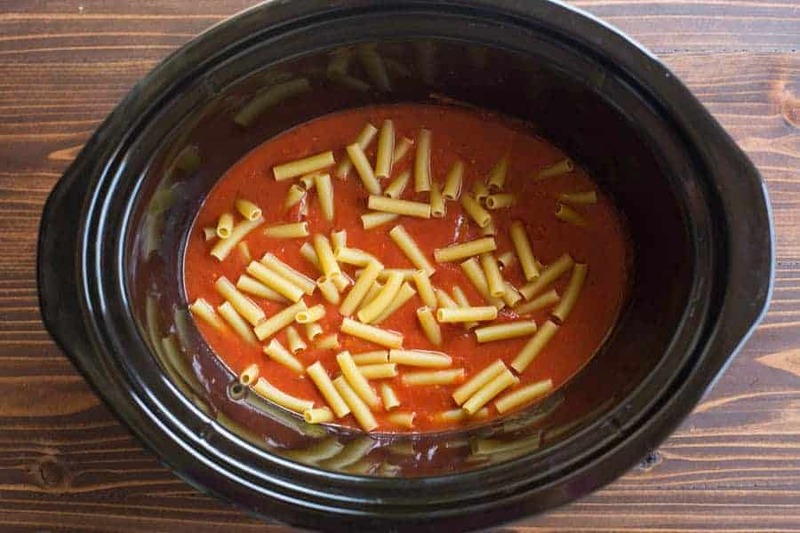 In a large bowl, combine both jars of pasta sauce, tomato sauce and water. Top with about ⅓ of the uncooked penne. Dot on half of the ricotta mixture and use a spoon to gently spread it out evenly. Top with 3/4 cup grated parmesan cheese. Add another 2 cups of sauce. Top with ⅓ of the uncooked penne. Add remaining ricotta mixture and spread. Sprinkle on the remaining 3/4 cup parmesan cheese. Add the remaining uncooked penne. Top with the remaining sauce. Cover and cook on HIGH for 2 - 2 1/2 hours, or LOW for 3 1/3 -4 hours or until pasta is tender. During the last few minutes, sprinkle the mozzarella cheese to the top, and return the lid of the machine to allow it to melt. After mine melted I stuck it under the broiler of my oven for 2 minutes to make the cheese golden and bubbly, but you don’t have to! Be sure the ziti noodles are covered by the sauce so they cook appropriately. I use a 6 qt. slow cooker! Anything that size or larger will work perfectly! I made this and now my boyfriend, his dad, my son, and my aunt won’t stop hounding me to make it again. Lol. I added a pound of hamburger last time, but I’m going to add some Italian sausage as well when I make it again tonight. It’s the bomb! I want to make this with some chicken so it’s like a super easy chicken parm. Can I use raw chicken bits or precooked? I’m trying to not fry and to make it easy! Hi Leah, I haven’t tried it but I think raw chicken would work fine, as long as it was cut into very small pieces so that it has enough time to cook all the way through. Hi! I love this recipe. I am wondering where you get the straight cut macaroni from. Velveeta used to have one called pre-cut spaghetti and it was the same as a straight macaroni noodle. Fideo is too small but it is the type of pasta in Kraft macaroni and cheese it’s not made into a c shape. I’m looking for what you show in your original picture. Thanks! I made this for my grandfather’s wake. My family loved it, said it was the best dish up there (in competition with several lasagnas). I took away 1 star because the timing for cooking. After 2 hours of cooking in high the noodles were pretty mushy. Definitely check after 1 1/2 hours. If you substituted with gluten free noodles, would you still put the noodles in uncooked or do you recommend cooking them prior? Hi Lisa, I’ve never tried gluten-free noodles so I can’t say, but I would probably add them like the recipe calls for, and you may not need to cook it as long.